What Are The Health Benefits Of Shrimp? Even though shrimp are small in size, when eaten with a meal, they provide vast amounts of health benefits. Though shrimp are small in size, when eaten with a meal, they provide vast amounts of health benefits. They belong to the same subphylum as crab, lobster, crayfish, and barnacles. The firm, translucent flesh of raw shrimp is found in a broad range of colors, depending upon the variety. They can be pink, gray, brownish, or yellow. When cooked, the flesh of shrimp becomes opaque and pinkish in color. In terms of the nutritional value of shrimp, it contains only 106 calories per 100 grams and is loaded with several proteins. Unlike some fish, shrimp are low in mercury content. However, 100 grams of grilled shrimp contains 152 milligrams of cholesterol, which is 51% of the daily intake recommendation. One of the health benefits of eating shrimp is that it helps the body produce healthy red blood cells to carry oxygen to all cells of the body. Iron is essential for hemoglobin formation. Also, better blood flow ensures that the brain is able to function better, since the brain takes in about 20% of the oxygen in blood. Shrimp are also rich in the mineral magnesium. Magnesium helps to relax blood vessels and thereby to alleviate migraines. Also, magnesium is directly linked to enhancing the quality, duration, and calmness of one’s sleep. It is possible that magnesium helps decrease the risk of sleep disorders and the chances of insomnia by properly regulating the metabolism of the body. Shrimp contains a generous amount of selenium with 54% of the daily recommendation per 100 grams. Selenium can improve bone health by adding strength and durability. It also strengthens the teeth, hair, and nails. This essential nutrient is a powerful antioxidant, which rids the body of free radicals. Minerals in shrimp, such as calcium, phosphorus, and zinc, also make enormous contributions in helping build strong bones and a healthy bone matrix. 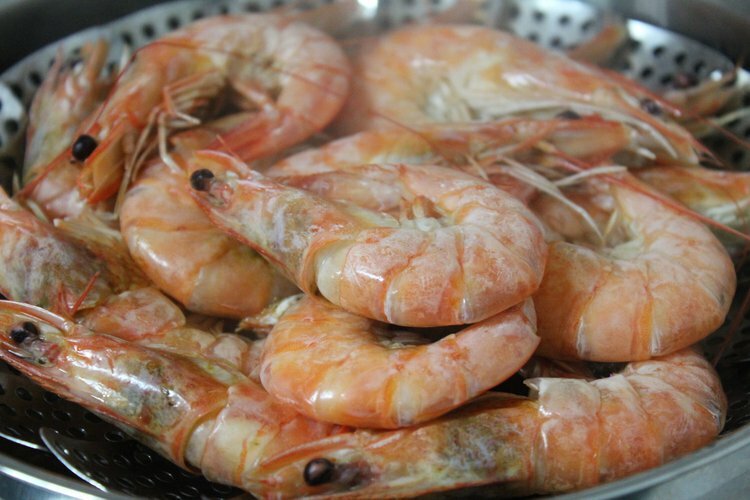 Shrimp is a good source of B-vitamin complex elements such as vitamins B12 and B3 (niacin). Vitamin B12 assists in energy production, but also helps with blood formation, DNA synthesis, and helps form the fatty substance around the brain cells, called myelin. Niacin has been known to increase an individual’s “good” cholesterol and reduce the risk of cardiovascular problems. A deficiency of niacin leads to Pellagra, a condition with symptoms that include diarrhea, dementia, dermatitis, and insomnia. Shrimp is also one of the few natural foods that contain vitamin D. This sunshine vitamin is regularly used for enhancing intestinal absorption of minerals like calcium, iron, magnesium, phosphate, and zinc. This can help keep the bones healthy and strong. A deficiency of vitamin D can increase the risk of poor brain function. Abbasi, B., Kimiagar, M., Sadeghniiat, K., Shirazi, M. M., Hedayati, M., & Rashidkhani, B. (2012). The effect of magnesium supplementation on primary insomnia in elderly: A double-blind placebo-controlled clinical trial. Journal of research in medical sciences: the official journal of Isfahan University of Medical Sciences, 17(12), 1161. Calvaresi, E., & Bryan, J. (2001). B Vitamins, Cognition, and Aging A Review.The Journals of Gerontology Series B: Psychological Sciences and Social Sciences, 56(6), P327-P339. Selhub, J., Bagley, L. C., Miller, J., & Rosenberg, I. H. (2000). B vitamins, homocysteine, and neurocognitive function in the elderly. The American journal of clinical nutrition, 71(2), 614s-620s. Holick, M. F., & Feldman, D. (1997). Photobiology of vitamin D. Vitamin D., 33-39.
ial health benefits. Nutrition reviews, 65(2), 63-77. Ngo, D. H., Vo, T. S., Ngo, D. N., Wijesekara, I., & Kim, S. K. (2012). Biological activities and potential health benefits of bioactive peptides derived from marine organisms. International journal of biological macromolecules, 51(4), 378-383. Udenigwe, C. C., & Aluko, R. E. (2012). Food protein‐derived bioactive peptides: production, processing, and potential health benefits. Journal of Food Science, 77(1), R11-R24. Barrow, C., & Shahidi, F. (Eds.). (2007). Marine nutraceuticals and functional foods. CRC Press. Domingo, J. L., Bocio, A., Falcó, G., & Llobet, J. M. (2007). Benefits and risks of fish consumption: Part I. A quantitative analysis of the intake of omega-3 fatty acids and chemical contaminants. Toxicology, 230(2), 219-226. Larsen, R., Eilertsen, K. E., & Elvevoll, E. O. (2011). Health benefits of marine foods and ingredients. Biotechnology Advances, 29(5), 508-518.